Just when you thought Christmas was over Chris Zephro gives all horror fans the biggest gift of 2018. This year Trick or Treat Studios will drop a screen accurate Good Guy doll and a Good Guy Doll with the iconic Chucky sneering face. 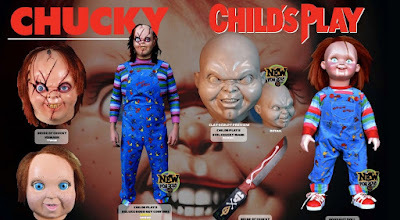 "Hi, I'm Chucky, and I'm your friend 'till the end! Hi-de-ho, ha-ha-ha!" Details on the release and exact shipping dates are yet unknown, but when all the details are finalized we will be sure to spread the information. As of right now though you can download the full Trick or Treat Studios catalog and check out all the goodness they have planned for 2018. UPDATE: Pre-orders on the Good Guy Doll will start in March with a price soon to come.